(CBS News) – They lived in the same house, worked together six days a week. They kept their money in a joint bank account. “Even thought together,” Wilbur said. That’s Wilbur Wright, born 1867. His brother Orville was four years younger. And as every schoolchild learns, the Dayton, Ohio, duo became the first people in history to successfully pilot an engine-powered airplane. “They had this passion, this mission; they were obsessed to succeed,” said historian David McCullough. So, in a new book, “The Wright Brothers” (published by CBS’ Simon and Schuster), McCullough — who has won two Pulitzer Prizes, two National Book Awards, and the Presidential Medal of Freedom — wants to reintroduce Americans to the Wright Brothers … and present someone else. The three siblings lived in a house now preserved at the Henry Ford museum in Dearborn, Michigan. Their father, Milton, was a clergyman; their mother, Susan, died of tuberculosis in 1889. Two older siblings left home to start their own families. He ended up opening a bicycle shop with his brother in 1893. They even designed and hand-built their own brand of bike. But in their spare time, the brothers became obsessed with the idea of another form of transportation: flying, reading everything they could find about previous experiments. Still the Wrights started building flying machines right in their bicycle shop. “The wonder is that they did everything, not just themselves, but did it here, and did it so well,” he said. Starting in 1900, with Katharine managing things at home, the brothers would ship their contraptions to the gusty, isolated dunes of Kitty Hawk, North Carolina. Their photo collection (now kept at their namesake Wright State University in Dayton) shows how they started with gliders, which often crashed, and finally designing a biplane with an ultralight engine hand-built by one of their shop assistants. Success came on December 17, 1903. Orville was at the controls. It was captured in one of the most famous pictures in history. And that’s where the story stops for most of us. But in a cow pasture in the outskirts of Dayton is where, David McCullough says, the Wright Brothers really invented the art of aviation — testing larger and more powerful planes. They learned to land, take off, and do figure eights. Meanwhile, the Federal Government was spending $70,000 (a fortune in those days) on a so called “aerodrome,” which crashed in the Potomac on takeoff. And no one in Washington seemed to care about what the Wright Brothers were accomplishing on their own dime. But the French, obsessed with aviation, took notice. In August 1908, huge crowds gathered to watch Wilbur Wright take to the air over the town of Le Mans. “They went wild, and he was a hero instantly,” said McCullough. So Orville was commissioned to show his stuff in a series of flights at Ft. Meyer, outside Washington. He was breaking all sorts of speed and endurance records, when on Sept. 17, 1908, he was assigned to take up a U.S. Army Lieutenant named Thomas Selfridge. And he and Orville crashed. Young Selfridge was killed — the first fatality of a passenger in an airplane. Orville was badly hurt, but nursed back to health by his sister, Katharine. 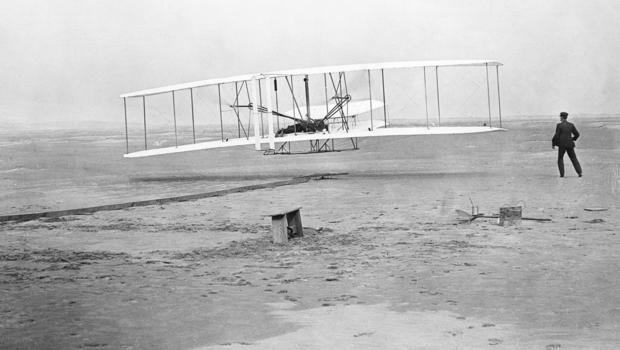 Orville Wright would indeed fly again — and Katharine would go up, too. 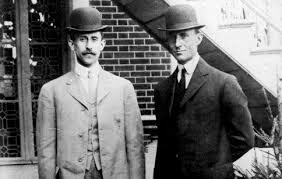 The Wright Brothers, who never married, became national heroes. Wilbur died of typhoid in 1912 at age 45. Orville would live until 1948, often accepting honors for what he and his brother accomplished — their lives a symbol of the power of imagination. Published May 3, 2015 at CBSNews. Reprinted here May 7, 2015 for educational purposes only. The purpose of an editorial/commentary is to explain, persuade, warn, criticize, entertain, praise or answer. What do you think is the purpose of the CBS News’ Rita Braver’s interview with historian David McCullough? Explain your answer.